Space is so unimaginably vast that it seems unlikely the human race will ever really be able to grasp the actual size of the universe in which we live. But that doesn’t mean we’ll ever stop trying. 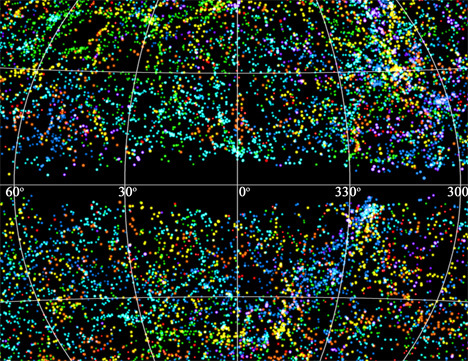 This map is the most detailed, most complete 3D depiction of the known universe ever created – and it took over a decade to make. The Two-Micron All-Sky Survey (or 2MASS) scanned the entire sky in three near-infrared wavelength bands. Redshifts, or measurements of galaxy distances, were added later to provide a more complete picture of the universe. 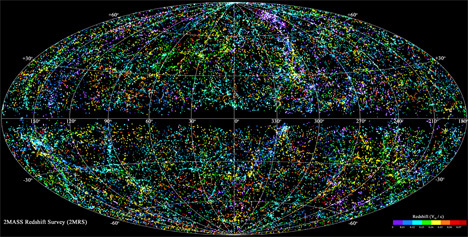 This map extends to more than 380 million light-years and shows over 43,000 galaxies. The only part of the sky not mapped – represented by the black band in the middle of the map – is the part we can’t see behind our own Milky Way galaxy. See more in Space & Time or under Science. March, 2013.